According to the NHS Dental Services 203,681 people aged 18 and under started NHS funded orthodontic treatment in England and Wales in 2017-18. Unfortunately, braces are a pretty normal part of childhood. Sometimes, it’s hard to tell if your child is going to require orthodontic treatment. So we’ve put together this list of things for you to keep an eye on and some information about how to seek treatment. It’s important to not worry or try to diagnose your child with an orthodontic problem, the below information is just a guide. If you would like to discuss your child’s orthodontic needs, you can do so for free by booking a smile assessment here. 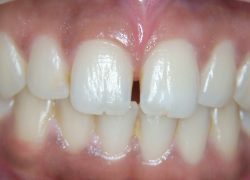 Crossbites are caused by a misalignment of the top and bottom arches (rows of teeth). 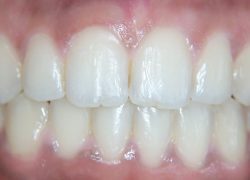 Sometimes with a crossbite, either upper or lower teeth sit too close to the cheeks or tongue, creating a cross like effect. The pictures above are an extreme example. 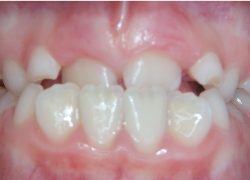 A crossbite will begin showing in childhood and will not improve as the child ages. A crossbite left untreated can cause problems later in life like tooth decay, gum disease and stress on the jaw muscles. 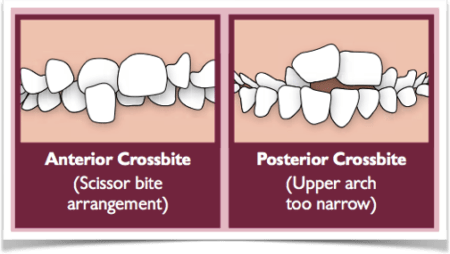 Crossbites are treated differently depending on the individual, but most treatment consists of using expanders and braces. Before and after pictures of a young Smile101 patient of ours with a crossbite. 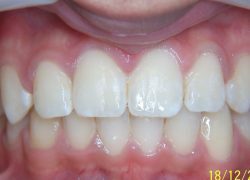 Crowding is a common problem that can often be resolved with braces if detected early without the need to remove adult teeth. 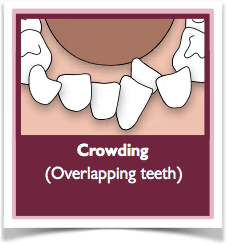 Crowding can be caused by baby teeth being lost too early or too late or can just be due to the fact a child’s jaw does not have enough space for all of their adult teeth to come through comfortably. If left untreated, crowded teeth can become difficult to clean correctly, leading to dental hygiene concerns like plaque and tooth decay. In some cases, crowded teeth can cause problems with chewing and biting which can lead to teeth being worn in strange places. 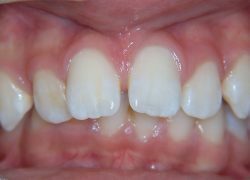 We treat crowded teeth with braces and try with all our power to not remove any teeth in the process, but each case is unique and sometimes tooth removal is necessary for treatment. Protruding teeth can be caused in children by sucking thumbs/fingers or occasionally the use of dummies. But this is not the only cause. 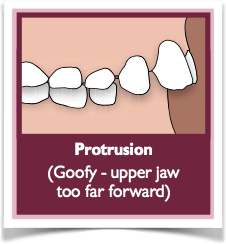 Sometimes, protrusion is purely down to the size and shape of a child’s upper and lower jaw. They can also be a side effect of crowded teeth, pushing the front teeth out of the mouth. 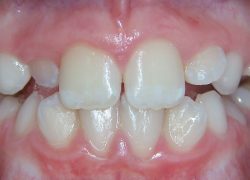 Active children with protruding teeth are more prone to tooth damage during activities as their teeth are exposed not covered by the lip muscle. Sadly many children can become self-conscious of their appearance due to protruding teeth. Sometimes, when the protruding teeth cover a lower lip they can become worse over time. Protrusion can also cause problems with a child’s bite, leading to uneven wear and difficulty digesting food. Treatment includes moving either the teeth backwards or the lower jaw forward (or both) depending on the causes for the protrusion, which is established by the orthodontist. 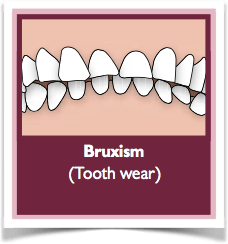 Most commonly, protrusion is treated with a twin block appliance or Invisalign mandibular advancement appliance. Sometimes if a child’s teeth are too small for their jaw bone, spacing between the teeth can occur. Children can grow out of gaps between their teeth, so if you have concerns about gaps between your child’s teeth you can take them to an orthodontist for assessment. 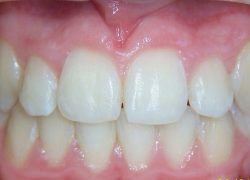 If the spacing between teeth does not improve with age, food can become trapped in the gaps leading to cavities. 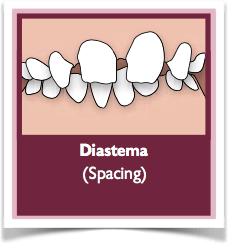 Treatment for spacing often involves a traditional metal brace, or if the patient is a good candidate then Invisalign braces are a great treatment option. Open bites are most commonly caused by the way the jaw grows. The sucking of thumbs/fingers or dummies can also contribute towards an open bite. Treatment for an open bite can vary depending on its cause. An open bite can lead to a number of painful side effects for children to deal with, like earaches, headaches, jaw pain, facial pain, sinus congestion and neck problems. 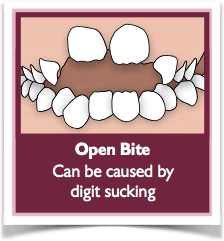 If you’re concerned about your child’s open bite, speak to your dentist or book an orthodontic assessment. 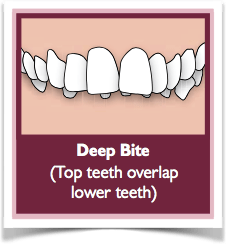 A deep bite is described as the upper teeth completely overlapping the lower teeth. 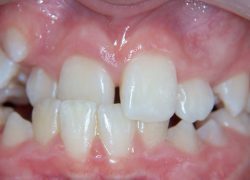 Caused by misalignment of the teeth and jaw, deep bites can cause some very serious problems for a child or an adult if left untreated. Damage can be caused to both teeth and gums as well as headaches, problems with jaw joints, problems with hearing and digestion as well as tooth wear and chewing problems. Treatment usually includes multiple braces over a period of time to correct the problem. The causes of tooth wear in children are often hard to pinpoint. They could be due to muscle overactivity, incorrect bites and deep bites. It’s best for tooth wear to be picked up early and to correct bite problems with braces or protect the teeth with a bite guard. Treatment for tooth wear depends on so many variables if you’re concerned about your child’s teeth book a consultation with an orthodontist for assessment. Your dentist will be able to guide you and help answer any questions about your child’s teeth and possible orthodontic treatment. If your dentist feels your child fits the criteria for NHS treatment, they can refer you to an orthodontist to begin treatment there. 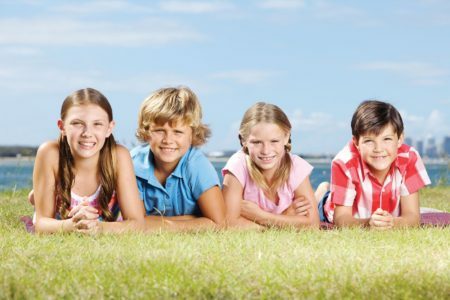 There is a common misconception amongst parents and dentists that a child must have lost all of their baby teeth before establishing whether or not the child needs orthodontic treatment. We like to see patients from as young as 7 for their first orthodontic assessment, as early detection can help us to avoid tooth removal and we can even begin orthodontic treatment on adult teeth before they have erupted. Our smile assessments are 100% free and if we establish that your child meets the NHS guidelines for free treatment, we can speak to your dentist and start the referral process. We can also talk you through our private treatment options should your child need braces and you want to begin treatment. Book your free smile assessment now or find out more about NHS treatments here.